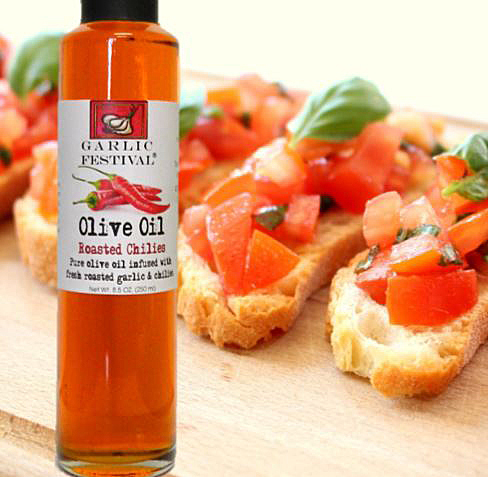 Drizzle Garlic Festival Fire Roasted Garlic Olive Oil over sliced baguette and toast at 400° until light brown. In a bowl, combine tomatoes, garlic, basil leaves, Garlic Festival Roasted Chili Olive Oil, juice from 1 lemon, 1/4 tsp each of salt and pepper. Gently toss and adjust salt and pepper to taste. Place over toasted baguettes and top with parmesan cheese.